Need a Breakthrough in 2010? Whenever Aladdin wanted a wish fulfilled, he rubbed a magic lamp to invoke the genie. You? What do you have? I'll tell you what you have. You ALSO have a genie, but yours is virtual. No need to rub. Just click. But before you do, you'll need to bring a challenge, opportunity, or problem to mind. Then frame it as a question beginning with the words "How can I?" Something you REALLY want to see manifest in 2010 -- whether it's business or personal. Once you have your "How can I?" question, click here. And if you like what happens with our online Genie, you can order the offline genie, here. Or license it for your intranet. 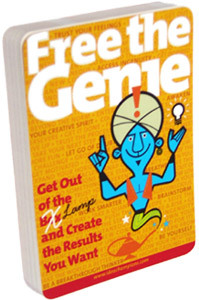 And while you're at it, check out my book on the art and science of manifesting new ideas. Mozart was composing and performing for royalty at 4. Ethan Bortnick, from Hollywood, Florida, is not far behind. Yes, practice makes perfect, but then there are those who are prodigies. And how about this 11 year old? They always seemed so predictable. Makes FAQs more fun to read. (Don't bail out too soon. Well, I guess you'll be the judge of that, eh?